This article is about the clone commander with ARC trooper armour. For other uses, see Clone commander (disambiguation). A Clone Commander is a minifigure based on Clone Troopers from the Star Wars universe. 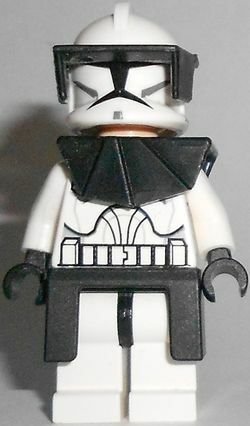 Like all standard The Clone Wars Clone Troopers, Clone Commander minifigures have white legs with a black hip joint, a white torso with black hands and a two-sided black printing design depicting clone trooper armour. It also has a flesh-coloured face with printed eyebrows, brown eyes, mouth and detailing, commonly covered with a white helmet with black and grey printing for the visor and other features. The only difference between a standard Clone Trooper minifigure and the Clone Commander is the accessories. Clone Commanders come equipped with kamas, worn between legs and the torso, and pauldrons, worn between the torso and the head pieces. They also wear visors over their helmets, and carry twin blaster pistols. Two different versions of the Clone Commander have been released to date - one with dark grey accessories, and one with black. Clone commanders were clone troopers with extra advanced training, and also engineered to be able to have more potential for tactical thinking and independence. Clone commanders could be assigned to field command centres, or to lead regiments into battle. They were often seen with additions to their standard set of armour, such as kamas and pauldrons. A Clone Trooper in the set 8098 Clone Turbo Tank was outfitted with a black pauldron and visor, however it has only ever officially been referred to as a Clone Trooper. This page was last edited on 6 October 2016, at 22:17.